Let’s admit the fact that buying gifts is not really as easy as it sounds! Especially, when it comes to doing the yearly over-whelming task of scouting for those last-minute Diwali gifts for all the people of your circle. Well, you are not the only unfortunate soul floating haphazardly in the cloud of confusion. We’ve all been through the same scenario like this. Walking through the cacophony of Diwali market, hopping from shop to shop, in search for the typical face-saving dinner set or a boring Mithai ka Dabba. 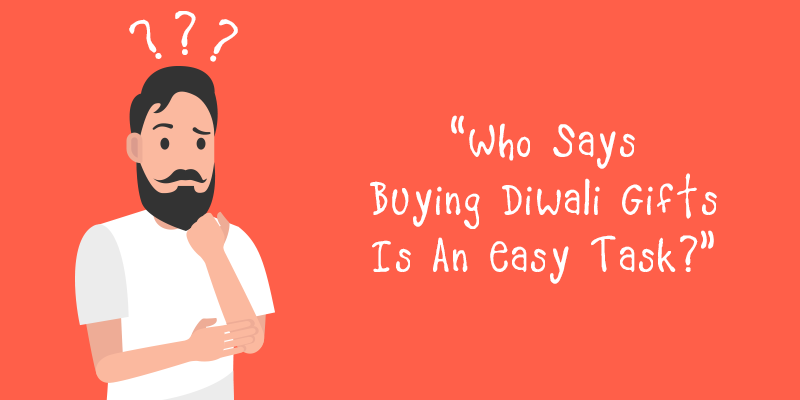 “ Ohh..again I will be left with not a single penny after buying all the Diwali gifts” - yeah man, each rupee count! “ I really wish no one gives me all these same Meethai Ka Dabba anymore...can’t you see am already fat? Then..how?” -Nope, most of them are not at all concerned about your health or waistline when buying these meethais. All they look for is some discount deal. “How about attending the Diwali celebration at Sharma ji’s place empty handed? Would he really mind..huh”? “Hey buy your own Gucci Bag on your own …it’s Diwali gift and Gucci’s Sarojini Market version is best for you” (no we are not talking about gifting it to your girlfriend but no harm in gifting it to your neighbor Chopra aunty as she keeps on saying not so good words about you on your back. 5. Why Am I So Poor? 6. Hey Bank-Balance, Why Do You Always Act As My Enemy? 7. Will Society Accept Me For Being So Non-Sanskari? 8. Some Time Random Gifts Are Life Saver!